A toolbox of ideas and practices for citizen leaders creating loving, conscientious, peaceful homes, communities and societies. Slow down and respect simple ideas and practices. Make both tiny and huge changes for love and conscience’s sake. Do what is important, not what comes readily or easily. Remain teachable, let go of old ways and open to new possibilities. Part I: Get Started with an orientation to prepare for this work. Part II: Love Life with practices for peaceful private lives. Part III: Act on Conscience with practices for peaceful public lives. 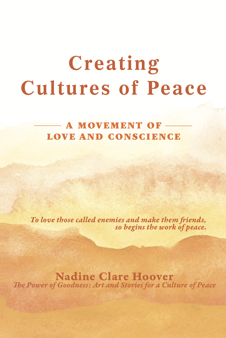 Part IV: Create Culture with practices for peaceful societies. Order from our online store, CourageousGifts.com! For wholesale orders, contact info@consciencestudio.com.